A decade or so before, I had stumbled upon Katchor’s strip featuring a real estate photographer, who despite always appearing with a camera case hanging around his neck, never seems to take a photograph. The weekly strip was appearing in a throw-away paper that I would pick up on my lunch hour. 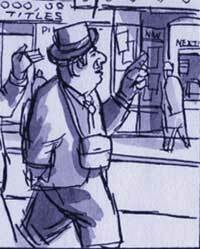 Rendered idiosyncratically in ink and ink washes, and set in a nameless city in an unstated year that could only be a long-lost New York City in an imagined nineteen forties, the flow of each cryptic episode is carried by a combination of omniscient narrative text boxes positioned above the dialogue balloons of the characters. And the characters, whose ethnicity, like their time and place also goes unnoted, could never be anything but Jewish. Katchor’s own context, as he put it, was a childhood spent in a Yiddish speaking household with communist parents. In the mid-1950s, as an army draftee killing time in a motor pool near Stuttgart, I stumbled upon a relatively little known piece of cartoon art history. Left lying on a work bench was an Army publication, a digest format titled “P*S” The Preventive Maintenance Monthly. With a title like that, it just had to be almost as exciting as all the other mind-numbing, bureaucratic crap the Army was then producing. Picking up the October, 1956 copy of P*S, I experienced a shock of recognition. It was unmistakably the work of the great Will Eisner. 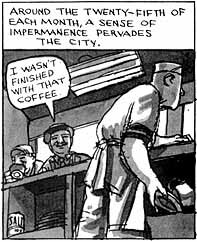 I knew the Eisner signature and style from his wonderfully drawn superhero crime-fighter strip, “The Spirit,” that ran in the comics section of the Sunday paper back home. Could this be, could somebody with the stature of an Eisner be illustrating a monthly Army “How-To” publication on the care and maintenance of military equipment? Eisner, who had served in the Army during WW II as an illustrator, had been asked by the Department of Defense in 1951, the start of the Korean War, to take on the monthly publication of P*S. He did and continued to do so for two decades, right up into the Vietnam War, finally dropping out in 1971. I’ve learned that the magazine is still in publication. The quality of Eisner’s draftsmanship and his sense of graphic style lifted the delivery of a modest “nuts and bolts” digest into a much-anticipated monthly event. “Connie Rod,” the provocative babe of a mechanic was pure Eisner, worthy of the best molls and dames that filled the frames of The Spirit. M/Sgt. Half-Mast, the old Motor Sgt. is a ringer for The Spirit’s Commissioner Dolan. And Eisner’s technical skills were on display in his renderings of all sorts of complicated military hardware; tanks, guns, vehicles and their component parts. I was impressed. Still am. Over my time in Germany, I accumulated several dozen editions of P*S, current and back issues. But like my collection of EC originals, somewhere along the way to becoming a so-called grown-up, they sort of wandered away. And as much as I read or scanned Eisner’s fine work in P*S, I never felt the slightest inclination to lift the hood of my jeep or deuce-and-a-half (two-and-a-half ton, six-by-six wheel Army truck) and perform any of the much vaunted preventive maintenance so well advocated by Eisner. Here are more of my comic book memories that Rob Kelly was kind enough to post on one of his amazing comic book sites. Check it out. I was thinking of doing a nostalgia piece on “trading comic books.” In truth I don’t have a nostalgic bone in my head, believing that the only element that makes the past seem attractive to older people is that back then, they were young. When comics were a dime in the late forties/early fifties, kids in row-house, city neighborhoods would become aware of other kids who were into comics, even if they didn’t personally know those kids. Early on a week-night, there might be a knock on your door, and a kid you might only know by sight would be standing there with a stack of comic books. A simple “Wanna trade,” was enough. A very talented freelance illustrator named Rob Kelly maintains a set of passionate sites devoted to comic books, comix that is. Rob was kind enought to post my comments on the war comic books of the late nineteen-forties and early fifities. Check out Rob’s amazing work at namtab.com. Don’t miss the Dylan portraits. One of those things I obsessed about as a kid was a comic book called “Wings.” It was during the Second World War and for three or four years I bought a copy every month. It was the cover art that got to me more than the stories or even the strip art. If you are not familiar with Wings, the cover shown tells it all, a gorgeous WW II aviation cover of a P-39 Bell Airacobra. When I discovered comic books, the war dominated my mind. Two other comic books were favorites; “Blackhawk,” and “The Boy Commandos.” The pilots in Blackhawk, an international mix of course, fought the evil fascists while wearing flashy Prisoner of Zenda, Hapsburg-style uniforms, and they flew stubby, little two-engine Grumman Skyrocket naval fighters that in reality never saw action during the war. The Boy Commandos were a comic book version of the “Dead End,” “East Side” or “Bowery Boys” movie gang who also helped win the war against the evil Nazis and Japs. I thought they were great. Now here’s a strange one. I rarely read a comic book. I looked at the pictures. If the artwork got my attention, I bought the book and looked at the pictures. The stories hardly interested me at all. When the Korean War started in 1950, I was twelve years old and already into the whole EC comic line. I had every on of their two war, or rather anti-war, comics, mostly for the Jack Davis and Harvey Kurtzman work, particularly the Kurtzman covers. I bought a couple of reprints back in the late eighties or early nineties and what surprised me was just how well the artwork, the Kurtzman covers specifically, have held up. After more than fifty years, I believe that in terms of graphic art, subject matter aside, it would be difficult to date them. They are wonderful. A Part of Kurtzman’s genius was an ability to convey a wealth information with a minimum of detail. Look at his 1951 Korean War piece “Contact.” The splash panel is a small masterpiece. The rendering of the winter tree holding a Chinese sniper is van Gogh-like, and the drawing of the rifle, absolutely minimalist, is still recognizably, a Mauser.